"I'm currnetly working on a project to discover 'great' self-help kinds of books to have my health education students read. I have read numerous books (probably close to 50) over the last year or so. Our school librarian is assisting me in creating my reading list as well as in acquiring copies for use by my students. Your book is one of those 'great' ones that I will include as part of my selection. You tell an uplifting and motivating story with solid principles 'woven' in." "Thank you for your donations of the Purpose Driven Life and Mentor: The Kid and the CEO." "I love the book! Thanks for the inspiration. As a high school teacher, reading this story gives me motivation! I really like 'the list' at the end of each page too"
"EXCELLENT book! I will make sure the students and staff all know about it and also get to read it." "Amazing! My wife and seven year old daughter finished reading your book in one evening. We simply couldn't put it down! A wonderful story that will intimately touch anyone who's ever made it the top, or just trying to figure out how to get to that next level. I'm adding this one to my required reading list for the young men I counsel, who are, in fact, searching for a better life and the means to get there! Thanks Tom and Walter for your inspiration!" "Our organization would like to thank you for the 20 sets of Mentor: The Kid and the CEO and workbooks. We will be using them this fall in our YouthBuild program for one of our literature classes and as an introduction to our mentoring component for our young people. Thank you for supporting us as we lay the foundation for our local youth." "I just want to thank y'all so much for your gift: a copy of Rick Warren's The Purpose Driven Life. My life had become completely hedonistic and without moral compass. I felt like the values I once had, dissolved in the face of the lifestyle I chose to live. I just want to thank you so much for your generosities and let you know how it has touched my life and strengthened my walk with the Lord." "This book is a powerful reminder of what we all know we must do and be in order to become authentic individuals in the world. I will keep the book in mind for friends." "Thank you for Mentor: The Kid and the CEO books donated to Junior Achievement. The book is filled with inspirational stories of overcoming challenges." "I thoroughly enjoyed it, and I am now reading it to the 6th, 7th and 8th grade classes. I am up to chapter 9 and they are very interested." "I wanted you to know that we finished our first course on Mentor: The Kid and the CEO the end of June. My students really enjoyed it. I feel like they are more prepared to face the world and their challenges when they are released. They took the program seriously and worked very hard on their workbooks." "I REALLY enjoyed the book and want to share it with my family and friends." "On behalf of the Sheriff's Office, and the inmate population we serve, please receive our gratitude for The Purpose Driven Life, and MENTOR: The Kid and The CEO. You provide for distribution to inmates at the Harris County Jail System." "I just finished reading your book. You are right, it is easy to read. I couldn't wait to see how the story ended. It sparked hope in my soul that people can change." "Thank you for making a difference. Thanks for equipping men and women for change. Thanks for sending hope. Thanks for all you do for so many." "After reading Mentor: The Kid and the CEO, I realized that this could be a great tool for me to use with the young lives I deal with daily. I have been able to give out more than 100 books to youth. I have seen the positive impact it has had on their lives. Without Mr. Pace donating these books, I could never have reached so many with the message his book gives. Thank you!" "I just want to say thank you once again for this amazing book, which I'm now sharing with others." 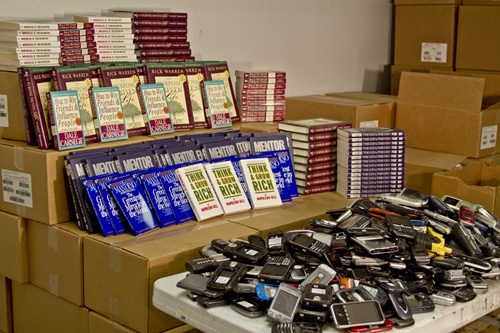 "Our church youth group has been using your company for collecting cell phones as a fundraiser. You have provided the collection boxes for us to display, and when we have a significant number of phones, we send the phones to you with the mailing labels which you have provided - not even costing us the shipping. We have been pleased to participate, and the money has greatly benefited our youth ministry."